COLUMBIA, S.C. -- Hours after Gardner-Webb put a scare into Virginia in the same building, No. 1 overall seed Duke found itself in a fight with No. 16 North Dakota State. In any other scenario the slow start would have been easily dismissed, but considering the circumstances of the afternoon's events the building was on edge for about 20 minutes. The Bison were moving the ball well, beating Duke with backdoor cuts and exposing the Blue Devils when they didn't rotate on defense. "We were just going through the motions," R.J. Barrett said in the locker room after the game, describing Duke's first-half effort against North Dakota State. Barrett, the team leader in points (26) and rebounds (14) in the 85-62 win, took matters into his own hands. With less than two minutes left before halftime and the score still way closer than anyone expected at 26-25, the Blue Devils forced a turnover and Barrett slammed home a vicious dunk. After the jam, Barrett let go of his calm and cool demeanor for a moment to let out a primal scream. "We needed to play with more emotion so that was just me trying to fire up my teammates," Barrett said. "Energy, emotion, effort - that's what we feed off of. We play so much better when we're playing with energy. We feel like when we don't have it, we're beating ourselves." A team with NBA talent and a once-in-a-generation college basketball player continues to circle back to the simple idea of energy. Mike Krzyzewski talks endlessly about energy to describe what was missing or going wrong during stretches of poor play and also why the team has been able to have success on the court. Every basketball coach in the country wants their team to play with energy, but when that spark hits Duke's roster the chain reaction is atomic. Coach K has the luxury of keeping it simple with this freshman-led team, not in spite of their youth but to facilitate the best basketball possible from the most talented team in the country. Play with energy, effort and enthusiasm and good things will happen. Which brings us back to Zion Williamson, the likely national player of the year who has done nothing but affirm that notion with his play since returning from a knee injury. Williamson's entire style of play is packed with energy, a carefully controlled but devastating kind of energy that when applied with force can wreck everything that an opposing team has planned on the basketball court. 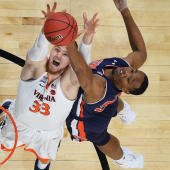 There were a few highlight dunks early, but Williamson admitted after the game that he, and Duke's whole team, was playing out of character early in the first half. The other side of the reliance on effort, energy and enthusiasm for peak performance is what Barrett pointed out after the game: the absence of it causes Duke to beat itself. Duke at its peak performance beats every team in the country nine times out of 10, but playing out of sync has that same team trailing a No. 16 seed from the Summit League in the NCAA Tournament. There hasn't been an entire game where Duke has looked out of sorts, but there have been enough stretches where the Blue Devils are not playing the "beautiful basketball" that Krzyzewski is trying to facilitate in pursuit of a sixth national championship. Sometimes Duke gets its energy from a less publicized sources, like Jordan Goldwire's contributions over the last month. Sometimes it's Zion. Sometimes Zion needs Cam Reddish to tell him to be himself and sometimes Duke's whole roster needs to see the silky smooth Barrett let out a loud scream to wake up and lock in. By definition, there is a finite amount of energy left for the 2018-19 Duke Blue Devils. This group has a minimum of one and a maximum of five games left together, and every player in the locker room is vehemently aware of this fact. Going through the motions will not be acceptable, and that's a standard that's set from the top of the rotation all the way to the end of the bench. As long as there is energy, Duke's not beating itself and if Duke's not beating itself, I'm not sure there's anyone in the country who will.